You may also find our page of Membership FAQs helpful. Read what our members have to say in Member Testimonials! Most music is written by the Director for the group, therefore he can modify the music to make it more challenging for advanced high school students or less challenging to fit the needs of middle school students. Advanced students get opportunities to create and perform instrumental solos and can build leadership skills mentoring younger musicians and leading sectional rehearsals. 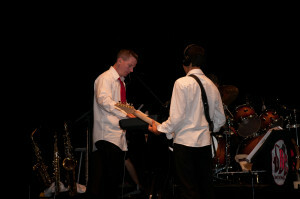 Student Musicians (grades 6-12) – Student Musicians attend rehearsals, perform at gigs throughout the year, and also earn Volunteer Service Learning Hours. They make up the majority of the orchestra’s membership. 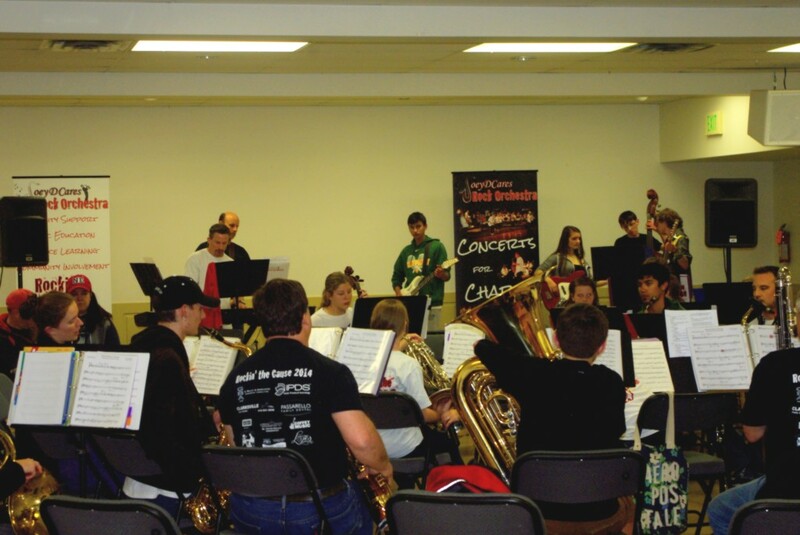 Students audition to become a student musician. 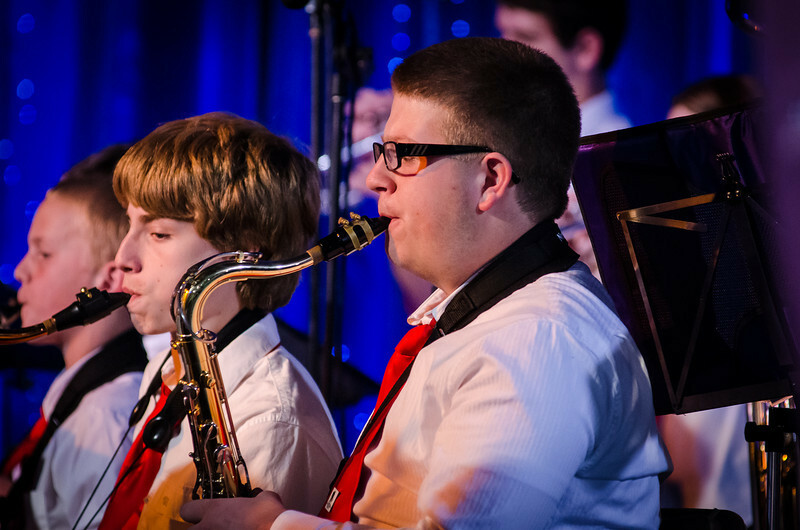 Junior Musicians (grades 6-12)– Students in grades 6-12 can join as Junior Musicians without auditioning. They rehearse with the group and learn the music. Junior Musicians do not perform at gigs until they have passed an audition. They are expected to contribute to events and gigs as part of the sound/stage crew, and they earn Volunteer Service Learning Hours just like Student Musicians. Junior Musicians interested in performing at gigs can audition to become a Student Musician whenever they are ready. Student Crew (grades 6-12) – The crew supports the orchestra by setting up stage, sound, and lighting equipment at gigs and some rehearsals. They earn Volunteer Service Learning Hours and can also take an active role in running professional sound and lighting systems! Adult Musicians and Crew Volunteers- Adult members of the community join in the fun and help support a great organization and other charities! They participate at rehearsals; perform at gigs or run sound, lighting and staging; mentor student members; and help promote an ethic of community service. Adult members do not need to have a family member in the group, although of course parents of student members are also encouraged to volunteer. Adults musicians interested in joining can contact Mr. Dundore at JoeyD@JDCRockOrchestra.org. 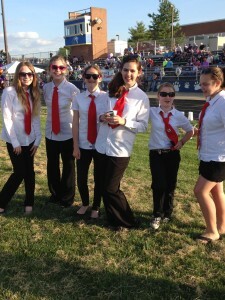 Students and adults who are interested in volunteering as a stage crew member should email JoeyD@JDCRockOrchestra.org. 4th and 5th grade musicians- Student musicians who are not yet in 6th grade do not normally join the orchestra; however, they can join in the Awesome Kids Band & Orchestra. Age levels in the orchestra and JDCRO Just for Kids classes are subject to the director’s discretion. Students not yet in 6th grade but with exceptional ability may be able to join the JoeyDCaresRockOrchestra as a Junior Musician at the director’s discretion; this may require an audition. Contact Mr. Dundore to discuss placement for your student. Come to a rehearsal on our calendar. Almost every rehearsal is an open rehearsal, open to prospective members and parents. If you would like to come to a rehearsal, just contact Mr. Dundore first at JoeyD@JDCRockOrchestra.org to let him know which rehearsal you plan to come to. You can bring your instrument or just come and listen! You can also watch us play at a live performance or watch videos of performances. Student and adult volunteers need to register online through the Freedom Area Rec sports online signup. Please review our registration process and session fees for detailed registration instructions. 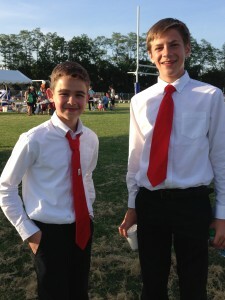 A registration fee is required for Student Musicians and Junior Musicians. There are no fees for volunteer adults or student crew. Students may sign up for any number of sessions. Many students participate year-round. It is fine to join mid-session; session fees can be prorated. Session registration fees are currently $99 per session for Student Musicians and Junior Musicians. There are no fees for adult volunteers and student crew. Sibling Discount! While the session registration fee for the first student in the family is $99, the second student is $89 and the third student (or more) is $79. Where do registration fees go? Rehearsals are held each Wednesday evening, usually from 6:15-8:00 PM, throughout the year. Usually, one rehearsal a session is a “give back” rehearsal where members have a chance to enjoy friendship and snacks and get to know members of the group better. Some Friday night rehearsals are scheduled throughout the year in preparation for larger concerts. See our current rehearsal and gig schedule. Rehearsals are held in Eldersburg. They are usually held at Freedom Optimist Hall, Piney Ridge Elementary or Century High School. When school is closed for the day or closed early due to weather, there is no rehearsal. If school is closed early due to professional development for teachers, that does not necessarily mean that there will be no rehearsal for the group. All members are required to sign a Commitment Letter indicating they understand their commitment to the JDCRO. Music will be composed and arranged at your level and ability so that you can contribute to the sound of the JDCRO while being challenged to extend and enhance your technique and skill. The JDCRO Director and your fellow members will help you stretch your imagination and build confidence with learning and performing a varied repertoire of music. You are not expected to figure it all out on your own. Most rehearsals and gigs will be scheduled before the beginning of each session. If needed, additional rehearsals may be added at the Director’s discretion and will be communicated to the members. Members are expected to attend scheduled rehearsals. Members are expected to be prepared for rehearsals and ready to start on time. Members are expected to attend scheduled gigs. Members must notify the Director if they cannot attend on a certain date. At the Director’s discretion, a member’s participation may be altered due to lack of rehearsal participation or adequate preparation.